developed Hall Farm Nursery over the past 32 years. 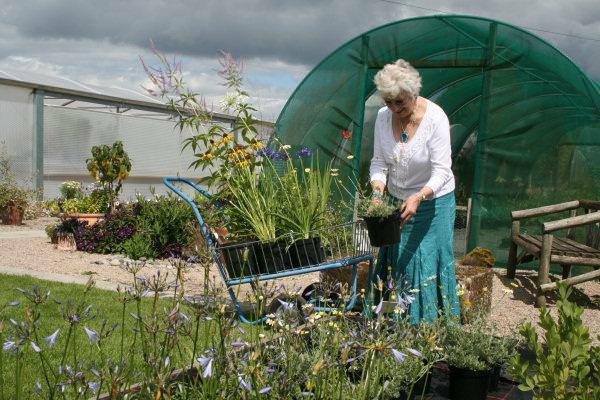 Christine and Nic both studied diploma courses at Pershore College of Horticulture & worked in different horticultural fields before starting the nursery. They also run a highly successful garden consultancy business. Christine is an RHS accredited Floral Judge and member of the RHS Herbaceous Plant Committee. Hall Farm Nursery has a fine reputation for its herbaceous plants. Peat free compost. Organic principles. Biological controls. The plants sold at the nursery are all propagated and cared for on site, using traditional methods and our own peat free high quality compost. The plants are well cared for at all stages, so you can be assured that you are buying a plant which will grow away well for you. A plant care regime is followed which includes regular tidying of plants and cleaning polytunnels & standing out beds. Biological controls, which are environmentally friendly are used whenever necessary. The nursery is attractively set out and there are well maintained display borders where many of the plants can be seen growing. 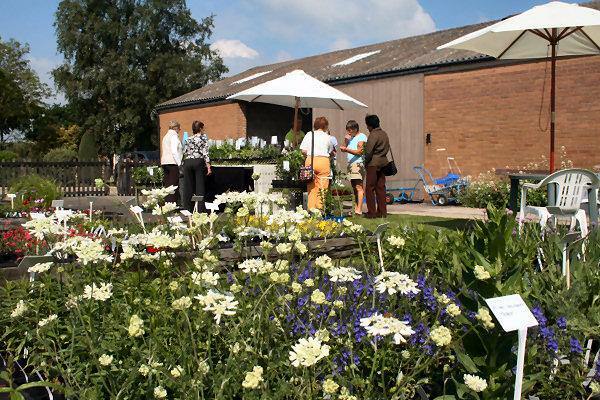 You can wander around at leisure in the relaxed surroundings & see the plants as mature specimens. The A to Z of plants contains plants which will be available at some point during the season - not all plants will be available at any one time. We are constantly propagating and potting plants, so that our stock is changing - but at any time the range of plants available is vast. All plants are hardy perennials unless otherwise indicated. We sell 'Hall Farm Nursery' gift vouchers, which make an ideal present for anyone who loves gardening. They can be used to purchase plants at the nursery or plant fairs. We can send them out directly for birthdays, christmas and special occasions. We regret that we do do accept vouchers from any other organisation. We have been awarded 48 RHS Gold Medals during our 20 years of showing, including the most prestigious Chelsea Flower Show Gold Medals in 2005 and 2010. 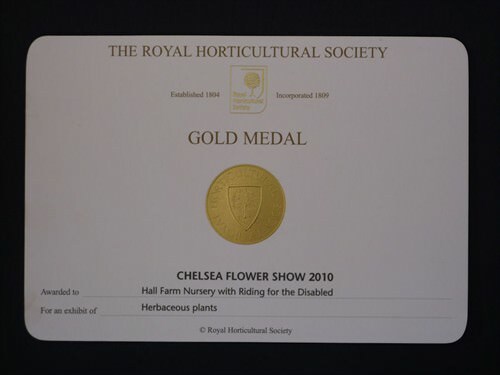 In May 2010 we staged an exhibit at the Chelsea Flower Show, for Riding for the Disabled Association, who were celebrating their 40th anniversary. Riding for the Disabled helps thousands of people to take part in riding, carriage driving and vaulting activities. It works across the spectrum of disabilities, age range, social status and urban & rural environments. The exhibit was a great success and the response from judges and show visitors was overwhelming. Our exhibit was inspired by the Riding for the Disabled poem 'I saw a child' which tells of a child who can't walk, riding through a field of daises. We had a wonderful wire sculpture made by Rupert Till, himself a regular Chelsea exhibitor. The pony and rider sculpture was set in a field of daises, surrounded by a hedgebank brimming with buttercups, cow parsley, foxgloves and ox-eye daisies. Through rusty irons hurdles and open gate the exhibit went through into a garden, allowing us to display many of our favourite garden plants. Still keeping the natural theme we used cultivated forms of native plants in the garden. Exhibiting at Chelsea Flower Show is a highlight of our nursery schedule.